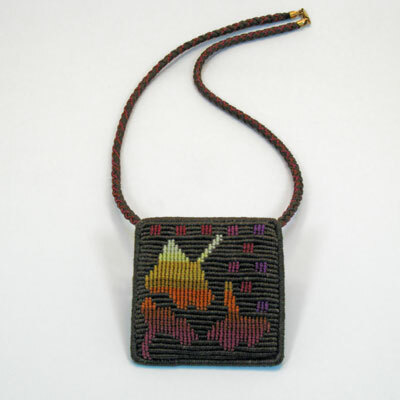 This miniature tapestry brooch is 100% Cavandoli style knotting with rows of knots snug against one another with alternating horizontal and vertical double half hitches. This piece is an homage to Diane Itter. Her work was an inspiration in my formative years. She created miniature tapestries knotted with the double half hitch out of linen. Many of her pieces had kimono shapes and patterns such as alternating squares and geometrical patterns with spacial shifts. 'Gingko Glide' is the inspiration for this brooch. The gingko leaf is of course a motif found in many artist work as a symbol of longevity. This piece is of special interest to textile collectors. 2 inch and 3/8th square brooch converts to a medallion. Nylon cord. Copper armatures. Leather lining.